The US Federal Reserve has slashed interest rates to 3.5%, its biggest cut in 25 years. The Fed, the US central bank, is trying to keep the US economy from slumping into recession and US and European stocks took heart from the move. Some analysts called the Fed move an act of "obvious panic" after Monday's global share slide. US President George W Bush has said that emergency economic measures will be passed soon. The Fed's move, which cut interest rates from 4.25% to 3.5%, came as a complete surprise, as it was taken a week before its rate-setting Open Market Committee meeting scheduled for 29 and 30 January. It came after huge declines in shares across Asia and Europe on Monday, with London's benchmark FTSE 100 suffering its biggest one-day fall since the attacks of 11 September 2001. The slump was a sign that the markets were not satisfied with the US president's proposed economic stimulus agenda worth at least 1% of gross domestic product, or about $145bn (£74bn), announced last week. This has led to speculation that the size of the package could be increased. Mr Bush met top Republican and Democrat lawmakers to thrash out details and the timeframe of the plans, which will include tax relief for business and individuals, in an effort to get the desired legislation enacted quickly. Mr Bush said: "I believe we can find common ground and get something done that's big enough... so that an economy that is inherently strong gets a boost." US Senate Majority Leader Harry Reid said Congress could agree laws to lift the US economy within three weeks. Cautious optimism greeted the Fed's action, stemming heavy falls on the European and US stock market indexes. The UK's FTSE 100 index closed 2.9% higher at 5,740.1 after falling more than 4% earlier. France's Cac also bounced back but Germany's Dax closed 0.3% down. In the US, shares on the Dow Jones and S&P 500 indexes still trailed, but their declines were not as sharp as when they had first opened. The Dow Jones index of largest shares finished more than 1% down at 11,971.2. "We're not out of the woods yet... we're still down on the day... but clearly the Fed rate-cut move was well received by traders," said Michael James, senior trader at Los Angeles-based investment bank Wedbush Morgan. "At least it was an attempt by the Fed to get in front of the negativity." However, other analysts were less convinced on the Fed's ability to take control of the current economic situation. "Unfortunately they have no power to reverse what in my opinion is the worst post-war recession," said Michael Metz, chief investment strategist at Oppenheimer in New York. The last two such emergency cuts were on 17 September 2001, shortly after the attacks of 11 September, and on 3 January 2001, in the wake of the dotcom bust. The last time the Fed cut rates as much as three-quarters of a percentage point was in August 1982, almost 26 years ago. 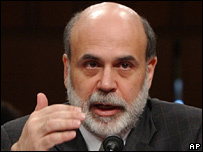 What if, after the Bernanke bounce, stock markets continue to fall? "This is huge," said the BBC's business editor Robert Peston. "And it is a big risk. If this doesn't work, then people will say they have nothing left in their locker." "The Fed is spooked by the markets, so no wonder the Fed felt it needed to take drastic action," said the BBC's economics editor Evan Davis. "Even if it isn't going to work as well as it did in 2000 [in response to the dotcom crisis], it might at least prevent markets and the economy driving themselves ever deeper in to a quagmire." Analyst Jeremy Stretch of Rabobank, described the Fed's move as "a sign of panic". "But it certainly indicates that the Federal Reserve wants to be seen as taking action over the concerns of an economic downturn," he said. Yet despite the Fed's extensive cut in rates, US investment bank Merrill Lynch said at the start of this month that, in its opinion, the American economy was already in recession. Another investment bank, Goldman Sachs, has also warned that recession is now likely. 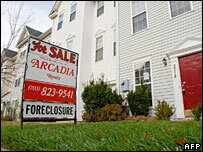 The sharp downturn in the US economy has centred on the slump in the American housing market over the past year. Against a backdrop of higher US mortgage rates, home loan defaults and repossessions hit record levels last year, specifically in the sub-prime sector. This industry specialises in higher risk loans to people on low incomes or those with poor credit histories. As the sub-prime mortgage sector hit crisis point, it triggered record losses at some of America's largest banks. It also caused the global credit squeeze, as much of this sub-prime debt was repackaged into wider debt offerings that were bought by banks and other investors around the world. As a result, global banks are now much less willing to lend to each other, or to homes and businesses, until the full extent of the sub-prime exposure is known. Should we fear a 'bear' market?